If you haven’t heard of printable electronics, this story won’t mean much to you. One more toy for the white coats, right? 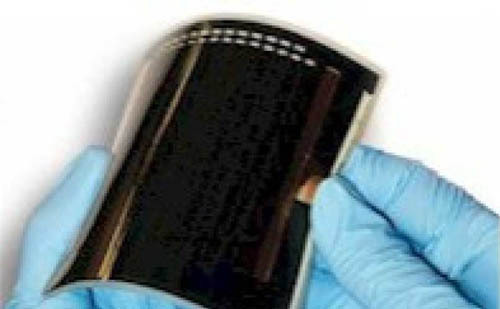 Printable electronics is a new way of making electronic devices. It hasn’t delivered much, yet, but it has a lot of potential. Circuits are built by printing on a paper or plastic substrate using conductor or semiconductor inks, usually organic. With multiple layers, you can build up a complex circuit. PE manufacturers have demonstrated thin-film computer displays and paper cellphones, but it’s likely that the most important applications will be in simple, cheap circuitry. With the right tools, it’s almost as easy to run off a thousand solar panels as it is to print a thousand sheets of newsprint. Solar panels made this way are less efficient than crystalline silicon, but they are very much cheaper. You might remember our previous discussions of grid parity, the point when solar-generated electricity becomes less expensive than energy from fossil fuels. Well, PE won’t make much difference to the arrival of grid parity — that’s going to happen in just a couple of years, given the steady price fall in current panel technology and rising coal and oil costs. But, when printed electronics hit the market, they’re likely to push power costs down still further. We’ll see the arrival of a whole new generation of cheap, solar-powered devices. The potential is for today’s expensive, long-lasting panels to be replaced by a new class of cheap disposable. Here’s where the North Carolina study fits in. PE technology is so new that we’re still figuring out how to make it work. With their X-ray study, the NC State guys were able to look at the behaviour of the inks in the printed circuits and think about how to make them work more efficiently. PE solar isn’t here yet, but studies like this will help bring it to life.